Now is the time to roll up your sleeves and really get your hands dirty. 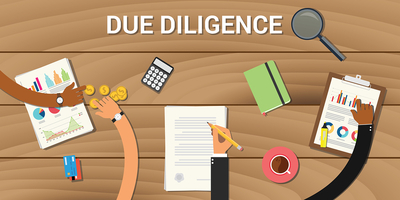 Due diligence is the single most important step in investing and yet it’s the step a lot of people ignore and then complain when all their money is gone. At this point you have completed Step 1 – explored your relationship with your money and determined how much you have to invest. You have completed Step 2 and understand your risk tolerance or management style. You have identified what asset classes you want to invest in and know how much money you have to invest in each asset class. Having completed Steps 1 and 2, you can focus only on the asset classes you’ve identified, saving you time and energy. While due diligence is not always enough, ask anyone who invested with Bernie Maidoff, understanding any investment you are looking at getting involved in is your responsibility and absolutely required. Developing clear rules around how and what you will invest in will rest easy knowing your money is working for you. If you are unsure about how and where to find investment opportunities, start building a team. Members of your wealth-building team will share experiences, expertise, industry knowledge, deal information and perhaps the capital or credit to do the deal. Think about the people that you know, friends, family, social media connections. Chances are they have money, expertise, contacts and energy. Join networks of wealth-building groups both online and offline. It’s important to surround yourself with good, honest, positive people who also are building their wealth. Having good money rules free you from emotional impulse investing (shiny object syndrome) and provide objectivity when evaluating investment deals. To get you started and by way of example I’ll share my money rules with you. These have been crafted over years of analyzing investments and making some painful and costly mistakes along the way. Please use them as an example or guide, don’t accept them as yours. 1. Never invest more than 10% of your investable assets into one project. 2. Never invest in an opportunity which conflicts with your asset allocation formula, no matter how good the investment sounds. Avoid shiny object syndrome. 3. Never rush into a deal, no matter what, there is another great deal right around the corner. 4. Never invest in an opportunity unless you decide to specialize in this type of opportunity (e.g., if someone offers you a great opportunity to loan hard money, don’t do it unless you have decided to specialize in hard money loans). • the personal transaction costs and risks in relation to the time period (e.g., I take money that was previously in a CD account, invest it in a project for six months, then receive proceeds: this looks like short term capital gains, that I’ll have to pay taxes on before spending my time looking for a new investment after only six months). • the investment is backed by tangible assets, i.e. real property. 6. Never invest in any real estate transaction that doesn’t have 35 % total equity and cash return to you in it by the end of the project. For example, you loan someone $650,000 to buy and finish rehabbing an apartment complex that will be worth $2,400,000 (at today’s prices) at the end of the project. At the end of the project, there should be at least $840,000 (35% equity) either still in the building or in your pocket, so if the market has dropped 15 – 20% you can still pay back the loan on the property and get your investment back. 7. Ask yourself the question: how long has the person or company been in business doing what they are doing? Have they done this kind of project before? Were they successful doing this in the past? Get references. 8. Invest only in projects where the person bringing you the opportunity has his/her own money invested. 9. Always have the terms of the deal in writing and make sure there is an exit strategy and the entities are set up for the best tax and exchange situations. • If this is a security being offered (most private placement memorandums are) check with the State’s Attorney’s Office to see if there is any problem with the securities or the company offering them. • Inquire at the Better Business Bureau for complaints. • Search the Web for articles and chat room gossip about the company. 11. Invest in only deals that you are involved in or someone you personally know and trust (not a person that one of your friends trusts) is involved in. 12. If investing more than $25,000, and the investment involves real property, do a site visit to the property to ensure all is as you expect. 13. If you can’t explain it, don’t invest in it. 14. Never break more than one of the rules above. What are your money rules? Please comment below. Missed Part 1 of our series Investment Strategies and Money Rules? Get it here. Missed Part 2 of our series – Investment Strategies and Money Rules – Diversification and Risk Tolerance? Get it now.